Open. The village shop is in the vestry, and the church is open every day from 10am to 12pm, although a very jolly old chap looking after the shop said that it is usually open for longer. He insisted on making me a cup of tea, and telling me about English bagpipes, which he sometimes plays in the church because of the acoustics. 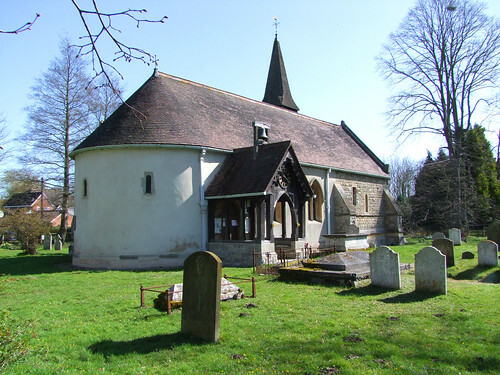 The reason for the acoustics is because this is the only medieval church in England with a round western apse - apparently, there was an eastern one too, but a late Medieval rebuilding of the chancel got rid of it. It presents a most unusual aspect from outside, not least because it has a north-east tower, so everything seems back to front like Dallinghoo in Suffolk. Internally, it is entirely Victorian, but very pleasantly done. Inside, the west end gives an illusion of this being a round-towered church. All in all, this was a lovely place to stop - an interesting church, a decent 19th Century restoration, and above all a very friendly welcome, everything a church should be. My new friend and I chatted for a while, and when I left he told me to come back and see the church when I was in the area, and 'tell all your friends to come, we like people'. And then off into the countryside proper at last to Wickham Bishops.